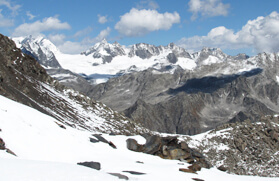 The glacier positioned at the foot of Manimahesh Kailash is named as Kamal Kund Glacier. This glacier forms a radiant lake known as Kamal Lund. This lake flows around 4 kilometres away from Manimahesh Lake. 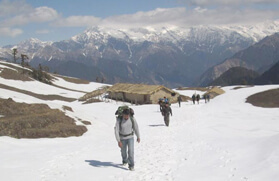 The trek to Kamal Kund offers the trekkers a rare occasion to explore the rituals and customs of the local people. The glorious views of Manimahesh Kailash engross the senses of visitors during the crack of dawn and sunset. The major attractions en route are Bharmour, Hadsar, Bharmani Mata Temple, Manimahesh Lake, etc. Manimahesh Lake is located at a distance of 27 kilometers from Bharmour at the foot of Manimahesh Kailash. 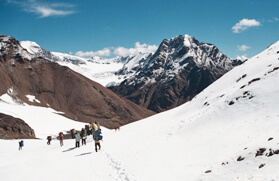 It is believed that Lord Shiva resides in this mountain laden with snow. 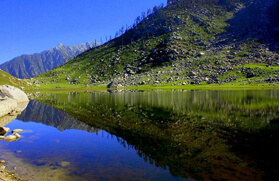 Thus, the lake and peak and considered highly sacred among the devotees. The fair known as Manimahesh Fair or Manimahesh Yatra is held at the lake every year during the months of August and September. the tour is held from Janamashtami to Radhashtami and it is said that both Goddess Parvati and Lord Shiva gets bath in this lake. People from all over the country and abroad take the sacred bath in this holy moment in Manimahesh Lake. On the way to Manimahesh, several sacrosanct places come en route. 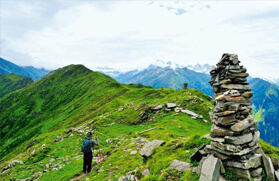 Dhancho, positioned 6 kilometers from Hadsar and Gaurikund, located at a distance of 5 kilometers from Dhancho, are the major places coming on the trail. After proceeding one more kilometer, trekker comes across Shiva Kalotri Spring, which is believed to have its source in the feet of Lord Shiva. 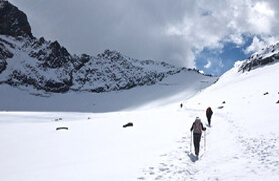 After moving a bit forward, the trekkers reach Manimahesh Lake that gives an enthralling and beautiful appearance. On the opposite side, there is roofless temple that is conspicuous with several iron trinkets. As per the folklores, it is mandatory to take a bath in Brahmani's pool before proceeding to Manimahesh Lake. 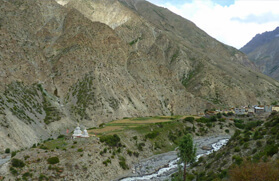 The route to Kamal Kung passes through Shiva Kalotri. It is said that the water of the Kund comes from Kailash and Lord Shiva uses this Kund to take bath. The trail further passes through Chobu Pass joining with Kugti Village. 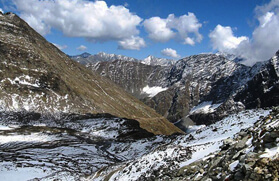 Kamal Kund also comes in the route of Manimahesh Parikrama. Very little amount of vegetation in there around the Kund and no vegetation is there in the Kund. Take a train for Pathankot in evening. Overnight train journey. On arrival at Pathankot meet our executive and transfer to Dalhousie by road which will take 3-4 hrs. On arrival check into the hotel and in evening visit local sight seen of Small Hill station Dalhousie. After breakfast at the hotel in Dalhousie in the morning, we will be moving ahead to the Kalatop wildlife sanctuary and then to Khajiyar. On the way, we will enjoy the beauty of Mini Switzerland and take lunch. After Lunch, we will move to Bharmour via Chamba. On arrival in Bharmour, check into the hotel. In the evening, we will join the Aarti at Chaurasi temples. Later, return back to the hotel in Bharmour for a peaceful overnight stay. Today, we will leave around 4:00 am in the morning after a light breakfast and with packed lunch in order to start our trekking trek to Manimahesh Lake via Sundarsi and Gourikund. Manimahesh Lake is just a kilometre away from Gourikund. After reaching Manimahesh Lake, we will get a glimpse of the beauty of Mount Kailash and the Lake. Enjoy rest of the day at lake along with a pleasure of spending a night in the camp at the Lake. After breakfast early in the morning, we will be leaving with packed lunch to start our trek to Kamal Kund. Kamal Kund is just 3 km away from Manimahesh Lake. 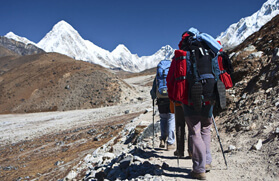 Follow the path over boulder and foot prints, we will reach the Kamal Kund. 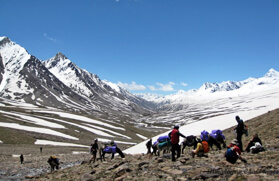 After reaching the Kamal Kund, we will get a glimpse of the beauty of Mount Kailash. Thereafter, we will spend a few hrs at Kamal Kund and later return back to the Gourikund then to Dhancho. An overnight stay in the camp in Dhancho. 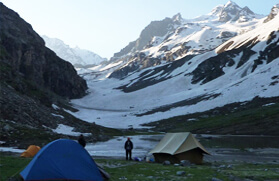 Today after having an early morning breakfast, we will trek to Hadsar via the same route and with packed lunch. We will take the taxi at Hadsar and reach Bharmour. A run of 04 -05 hrs will reach you at Bharmour. On reaching Bharmour, check into the hotel and revive your body. In the evening, we will visit the ancient Chaurasi Temples and local market of Bharmour. Later, return back to the hotel for an overnight stay. After breakfast in the morning, the departure of the group will be done from Bharmour. We will move to Chamba and take lunch here. Thereafter, we will visit the Laxmi Narayan Temple and Bhuri Singh Museum. After that, we will move further to Pathankot train station and from here catch night train for Delhi. Overnight train journey.